With many different options in material handling, it is hard to know what tool you need to get the job done. Your needs may vary depending on the job you are doing. Some people may need to move multiple lightweight objects across a factory, some may need to carry a 3-ton piece of machinery a few feet. Others may even need to lift construction equipment to the top of a building. That is where Jib cranes come in. They are specialty tools they have a specific role and skillset in moving objects. For those that don’t know what a jib crane is, it is a crane that has a vertical pole, and a horizontal pole coming out of it at a 90-degree angle. The horizontal pole usually pivots atop the vertical pole, having either a 180 or 360 degree turn radius. This horizontal pole, called a boom, swings around an arc shaped path around the vertical pole. At the far end of the boom, a cable is usually attached to a winch, which is used to lift items. There are three types of jib cranes; free standing, wall mounted, and davit. Free Standing – Free standing cranes are the most common type of jib crane. This configuration is what is described above; a floor mounted pole with a boom that rotates horizontally around it. You will find this configuration where mobility is not needed. See our best jib cranes post for good recommendations of this type. Wall mounted – As the name implies, this configuration is mounted to the wall instead of the floor. By mounting it to the wall, there is no longer a need for two poles. The boom comes directly off of the wall and pivots off of it. The disadvantage of this configuration is that by mounting the boom to the wall, the maximum turn radius is 180 degrees. Davit –While davit cranes have the same basic shape as jib cranes, davits have the ability to move the boom vertically, changing the angle that it comes off of the vertical pole. Both usually have cables and winches to aid in carrying/moving tasks. Jib cranes tackle many different tasks in the material handling space. They have uses in construction, factories, and warehouses, and even grain elevators. Although they have many different uses, they tend to be used the most in situations where they have an advantage over other crane types. Mobility being a major strength, they can find themselves on construction sites used to lift supplies and equipment between floors or from ground to rooftop. Advantages – As highlighted before, the big advantage of jib cranes over other types is their mobility. One can be installed in less than 4 inches of concrete, so they can be used inside, outside, or even rooftop. Another advantage is affordability. One can be purchased for less than a hundred dollars at the entry level. At the industrial level, they are still more cost effective than renting a mobile crane unit. 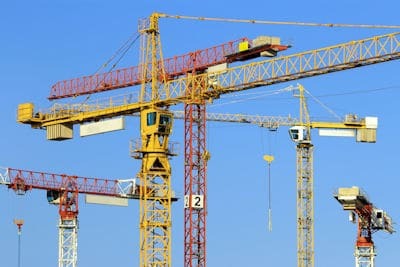 Cost – Relatively speaking, jib cranes tend to be less expensive than other cranes. They can range from less than a hundred dollars at the entry level up to several thousand at the industrial level. Still, because of the mobility and versatility of the jib, they can be much cheaper than renting mobile cranes, while still getting the same job accomplished. jib cranes have many uses, from home use to construction, making them a major player in the material handling industry. There are a few different variations of jib cranes that all have their own strengths and weaknesses. Generally sacrificing carrying capacity for mobility, these cranes are quite the Swiss army knife tool. Varying immensely in price to fit all budgets, jib cranes just may be the piece of equipment you need to help you get the job done. For detailed information on specific jib cranes, check out our reviews.